"Greeeeeeat news T-Mobile G2 owners as today is a magical day for you. That's right I'm talking about a Gingerbread OTA update that begins today and will rollout over the next few weeks to all G2 owners." It's always good to see another Android device get its Gingerbread update. 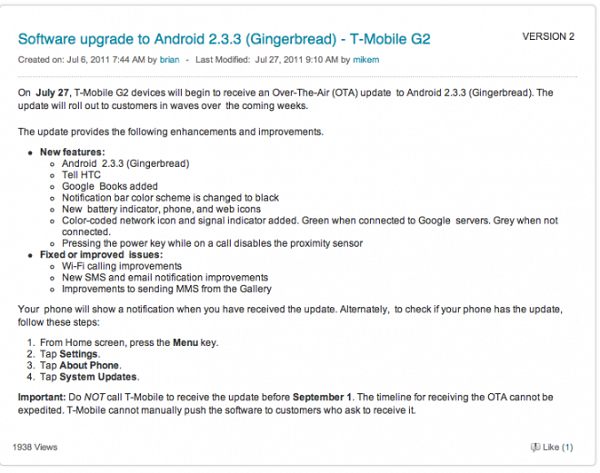 This little bump brings the T-Mobile G2 up to Android version 2.3.3 (Gingerbread). If you haven't received your over-the-air notification yet get in there and start spamming that "System Updates" button.